Checklist for Entrepreneurs - Is Your Business Legal-Ready? Whether you are a current start-up entrepreneur, working professional, or someone who is looking to launch your own business in the future, you are invited to join us on Wednesday, 29 November 2017 for a lively panel discussion on the topic of “is your business legal-ready?”. During the different phases of the start-up cycle, there is a range of legal requirements that may be relevant. Come and learn about the main legal areas that every start-up or business should be aware of. Our panelists from the Stephenson Harwood team specialize in intellectual property, regulatory and compliance, and corporate and commercial matters. The panel will have a leading start-up entrepreneur who will share some stories and the legal challenges that he or she had to overcome while scaling up. 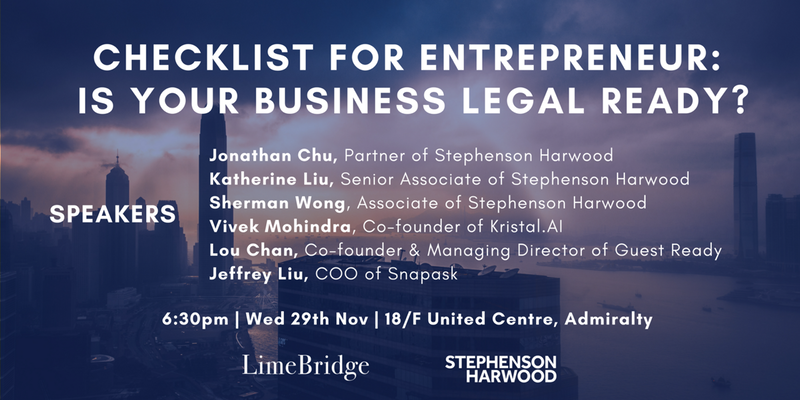 Come and network with established entrepreneurs and like-minded people within the start-up and business scene, and discuss your burning legal questions with lawyers from Stephenson Harwood. Registration is on first come first serve basis. A big thank you to Stephenson Harwood for opening up their beautiful office and for sponsoring F&B for this event! Jonathan is an intellectual property lawyer with substantial experience in IP litigation and enforcement strategies in Hong Kong and China. He has advised and represented numerous well-known international companies and brand owners on successful large scale enforcement efforts in the region. Besides litigation, Jonathan’s practice also covers advising on non-contentious intellectual property and commercial matters, including advising on a broad range of matters tailored for start ups. Being a member of the regulatory compliance team and focusing on financial services sector, Katherine has advised financial services clients on a wide range of issues such as regulatory compliance, commercial and employment law issues for more than 10 years. She is known to be able to give precise and commercially sound advice. Her clients include TNG, which is a Fintech company, and various asset management startups. She has acted for various banks and financial institutions and advised them on their on-going operational and compliance issues. She also advises on financing and refinancing transactions. Sherman is an associate in the Hong Kong corporate team. He has represented private and listed companies, multinational corporations and financial institutions in corporate and commercial matters such as mergers and acquisitions, takeovers, commercial contracts, pre-IPO investments, IPOs, and regulatory compliance. Sherman has acted for clients in various sectors including digital payments, e-commerce, online education, legal research, property development and investment, energy, retail, aesthetic medicine and financial services. Vivek Mohindra is a co-founder and responsible officer of Kristal.AI, an asset management platform that gives investors access to independent advisors and portfolio managers. He has 20+ years’ experience in trading/ investing in Asian credit markets including complex and structured products. Vivek is a highly sought after speaker in the area of fintech and the future of A.I. Vivek is a former executive director at Natixis and UBS. He had also served as vice president at Citibank in Singapore from year 2003 to 2005. Vivek holds a master’s degree in business administration from Indian Institute of Management Ahmedabad and a bachelor's degree in commerce from Shri Ram College of Commerce. Jeffery LIU Xun is the Chief Operations Officer at Snapask Holdings, an education technology company that lower the barriers of entry into basic education. Snapask creates products that makes it easier for students to learn, and teachers to teach their respective curricula. Snapask also works closely with governments across Asia in order to standardize and digitize their curriculum, allowing students to more efficiently access the education content. Prior to joining Snapask, Jeffery founded a patent holding big data analytics company which was later on sold to 中国ONL。Currently, Jeffery's time is now split between growing Snapask into a publicly listed company, and working on open source distributed ledger projects. Prior to GuestReady, Lou was a part of Hong Kong’s founding teams of Rocket Internet ventures WIMDU (vacation rental) and ZALORA (online fashion retailer). He also co-founded Captcha Media, a digital marketing consultancy in Hong Kong, where he advised leading companies in consumer industries in Hong Kong and China on their marketing strategy. After graduating with full scholarship in Finance & Economics from University of Toronto, Lou was working as an FX trader at Crédit Agricole. Lou has already helped more than 100 hosts to optimise their vacation rental listings for higher occupancy, without trading in the fun or human experience of hosting guests.